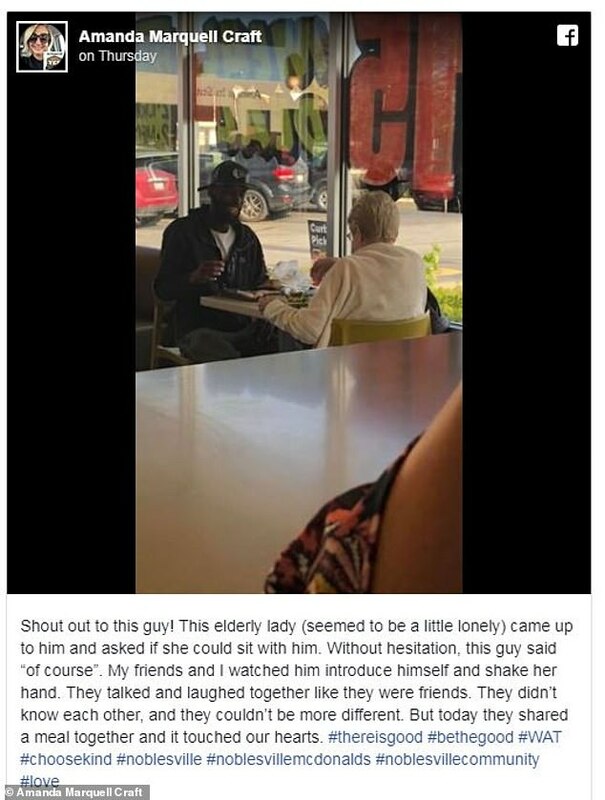 A touching image of a young man and an elderly woman who were strangers bonding over breakfast at McDonalds has gone viral online. Eric Haralson, 28, was sitting down to a late breakfast on Thursday in Noblesville, Indiana when he met a woman who became his friend. A teacher was eating lunch at the restaurant were intrigued by the encounter and took a picture of it, which has now gone viral on social media. Eric explained that he enjoyed the conversation and said they got along well even though they were total strangers. He told Yahoo Lifestyle: 'I was eating breakfast by myself, just catching up on the NBA games that I missed the night before and Jan Jessup, being the center of attention that I assume she has been all her life, sat at the table across from mine. Originally, Jessup sat down with a group of teenagers because she was intrigued by one of their man buns. 'She asked him about it and who helped him with that style because she has never seen it before and he responded with his mom, and then they exchanged a few words and she was off to get napkins,' he explains. When she came back, the kids were gone and Jessup was confused and alone. 'She thought that she had scared them off,' Haralson said. That’s when Jessup turned to the 28-year-old and he explained: 'Before she sat down, she asked me if I like to eat alone, I responded with, ‘No ma’am, I do not. 'So, she asked Haralson if she could join him and he replied: 'Please do'. They ate together for about 45 minutes, talking about everything from how Jessup wanted her car painted to love to spiritual topics to 'what seemed like her favorite topic, love thy neighbor'. Haralson estimated that she was about between 60 and 70 years old. 'She never mentioned if she lives with someone, just mentioned someone by the name of John Boy. 'She lives very close to the McDonald’s, and she used to have an obsession with Caramel Frappés until it made her sick one day. 'So now when she comes in, she usually gets a grilled chicken salad, which she had that morning'. She shared photos of the pair who 'couldn’t be more different' bonding over salads and fries on Facebook. Her post has almost 2,000 reactions and hundreds of shares. Fellow diner and teacher Amanda Marquell Craft witnessed the whole thing and caught their interaction on camera. She shared photos of the pair who 'couldn’t be more different' bonding over salads and fries on Facebook. She and her friends later told WTHR the moment touched their hearts. Her post has almost 2,000 reactions and hundreds of shares. 'So kind and caring. I love it, this is the way America should be all the time,' someone commented. 'It’s how more people should be, someone else agreed. Ah my heart this is adorable', another person wrote. 'This makes my heart warm'.